It might demand some nerves and a giant leap of faith while you try to hold yourself together and refrain from looking at the gaping mouth of the abyss. The egg-shaped rock you are about to step on will become your crowning platform while, maybe like Saint-Exupéry’s Little Prince, you discover the whole new world of courage and survival. Your planet is Kjeragbolten, a round stone block wedged solidly in the crevice of the Kjerag Mountain, almost one kilometer above the sea level. 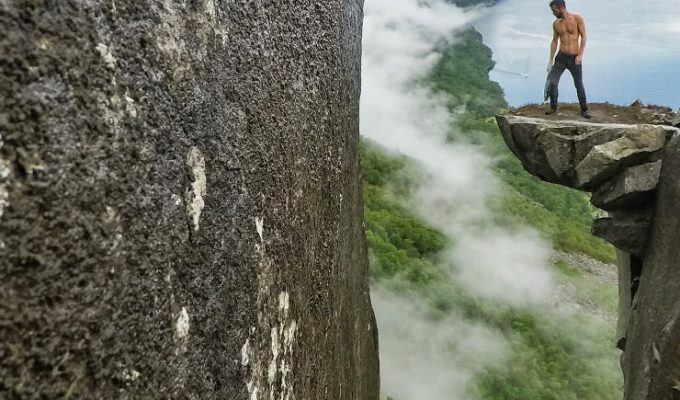 It is rapidly becoming one of Norway’s most popular hiking destinations for testing one’s bravery. 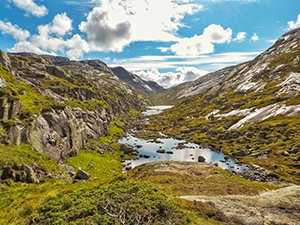 Are you up for the Kjerag trek challenge? 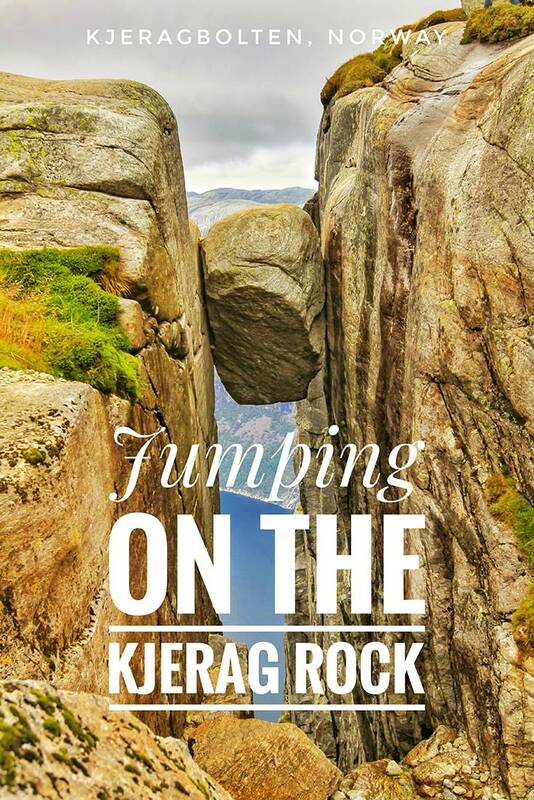 Do you have what it takes to step on the Kjerag rock? If mountains would be laying eggs, this would probably be the most unusual nest of all. 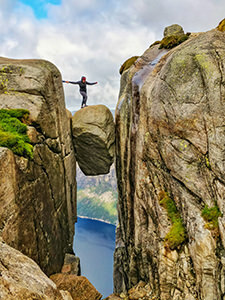 Stuck between the two mountain cliffs on the southern side of the Lysefjord, above a daunting drop, Kjerag boulder is an unusual result of a usual geological process. The five-cubic-meter rock was deposited during the last glacial period, estimated at 50.000 BC. In the continuous alternating game of melting of the Norwegian Glacier and flooding of the valleys, this rock got jammed in the rock formation that many millenniums later promoted it into a prime tourist attraction. 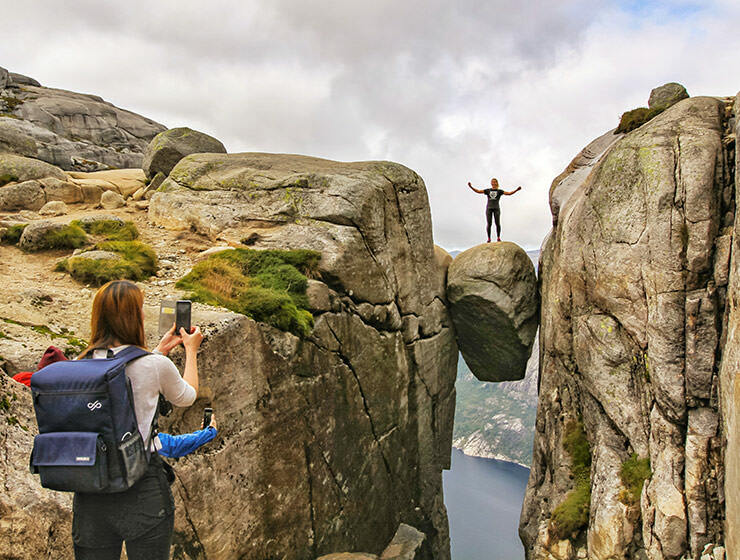 Suspended above the kilometer-deep chasm, Kjeragbolten is a seducing spot to take your daredevil picture on. 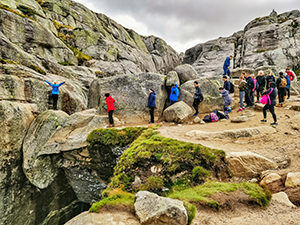 In an adapted version of the old dilemma about the chicken and the egg, people are queuing in long lines to step on Kjerag. After waiting that could last anywhere between a few minutes and an hour, just before their moment to step on the stone egg arrives, some of the hikers simply – chicken out. Kjerag got its name probably through combining the words kje (kid) and rag (goat’s hair). It might be that the shaggy-looking surface of the rough mountainside reminded Norwegians of goat babies’ hair. I haven’t seen any goat, but quite a few sheep were using the gorgeous valleys as the grazing ground. They were bravely jumping from one rock to another, not caring at all about the fact that humans marked this hiking route – as advanced. Sheep’s bells were adding up to the idyllic atmosphere, heightened up by the wooden pathways and streams cutting through the green carpet-looking meadows. The scene did look like a painting, but trust me: Saint-Exupéry did not draw the sheep, they were real! However, there were no trees on Mount Kjerag, so one shouldn’t expect any shade on the hike! Some more massive boulders offered the only shadow one could find on the way. They did not end up wedging in some dramatic setting, but that doesn’t mean they didn’t present great photo ops! I stopped by many of them! They were almost praying for a snapshot, while the majority of the hikers would just be rushing to the Kjerag star. It is not easy to compete with the reputation of the famous ones! For steeper parts of the Kjerag trek, use the guide chains for assistance! Don’t get lost at Kjerag trek! The hiking path starts at the Øygardstølen parking lot. There are three steep ascends in total (the first one being the hardest part), but more challenging sections come with guide chains which provide significant assistance. Do use them! They will help you not to fall on Kjerag! Also, consider wearing gloves when grabbing the chains, as this might reduce the pain in your fingers afterward. In between these ascends, Kjerag hiking path goes over two green broad valleys: Little Stordalen and Stordalen. It ends with the walk over the polished granite of the Kjerag Massive to Nesatind, the place of the most spectacular views. 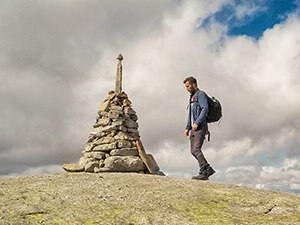 While the largest part of the route is clearly marked with cairns (stone pile markers) and red T’s painted on them, many people lose orientation in the final part of the Kjeragbolten hike. Possibly distracted by the views, maybe confused by too many decorative cairns, perhaps by just following other lost hikers in front of them… They stop following the ‘T’, and end up going too much to the right (the side looking at the fjord). Be careful, look at (hopefully) where people are returning from – this is the correct (and ONLY) entrance to the notch-approach to Kjerag boulder. So: instead of heading to the cliffs directly, you need to go a bit further up on the left side, before descending through the shallow streambed. I stayed near the Kjerag stone for four hours, and every several minutes there would be hikers coming from the wrong and utterly inaccessible direction. With me waving to them and hand-sign-instructing on how to reach the boulder, some thought I was even a mountain guide! The signs could definitely be improved at the end of the path! That’s the mountain guide in me speaking. While I was navigating the lost hikers from a distance, someone might have thought that I engaged in the most altruistic behaviors of all. The truth is it was quite the opposite. With a constant flow of incoming hikers, I knew that longer they hike, the longer it will take them to leave the place. So in a fantasized scenario of mine, if I’d help them to reach the boulder sooner, they would also leave sooner. And I would have it all for myself! Frankly, I hate queuing and making the selfie fool of myself in front of everyone. I also dislike hiking in the crowds, especially if they consist of loud-music-playing Chinese and overtly enthusiastic Ukrainians flagging Kjeragbolten up with their real national flag, as if they are conquering the Moon. But my efforts were futile. With all my “helpful” guiding through the mountain, the flow of visitors wouldn’t slow down. In four hours of my guard, there was no moment of rest for the poor Kjerag boulder. Hundreds of people enter the queue in front of this extraordinary spherical rock. Some step on it, others crawl out on it, depending on how severe their fear of heights is. The access to the boulder is around the small ledge, and this part probably demands more courage than standing on the rock itself. 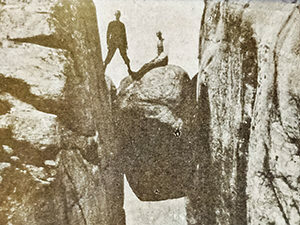 There is no record of any fall down accident at Kjeragbolten. Kjerag and danger are still words worth considering together – approach the boulder with caution! Do not rush yourself, take a moment to breathe in after the strenuous hike, drink and eat something. For accessing the Kjerag boulder, you can use the rope for assistance. I’ve seen a girl not even paying attention to the string attached to the rock, and almost entangling her foot just before stepping on Kjerag stone. I’ve also seen another one jumping for the photo, and having quite an ungraceful landing. If you don’t have the ballerina sense of balance, do not jump! Just because you’ve seen other people doing something risky, it doesn’t mean you are capable of repeating it! Know your limits, and act accordingly! If you have an underlying sense of balance, stepping on Kjerag boulder is relatively safe. There were no deaths or accidents on Kjeragbolten. Norwegians claim that the rock has the lucky charm! However, a cliff nearby is one of the world’s most active BASE jumping sites. Since the first registered BASE jump on Kjerag in 1994, more than 50.000 jumps happened here. 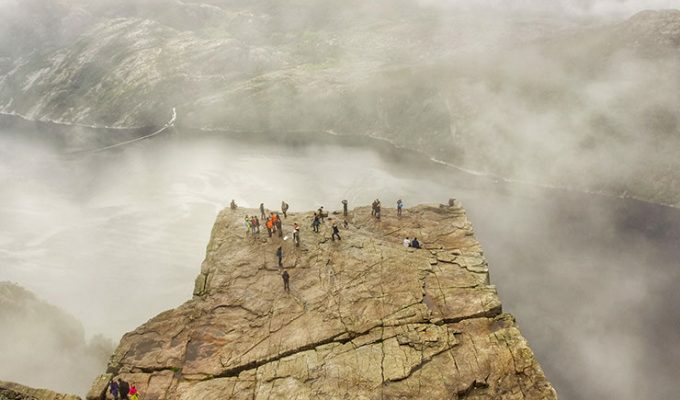 Sadly, it is still a dangerous sport; twelve persons jumped from Kjerag into – death. 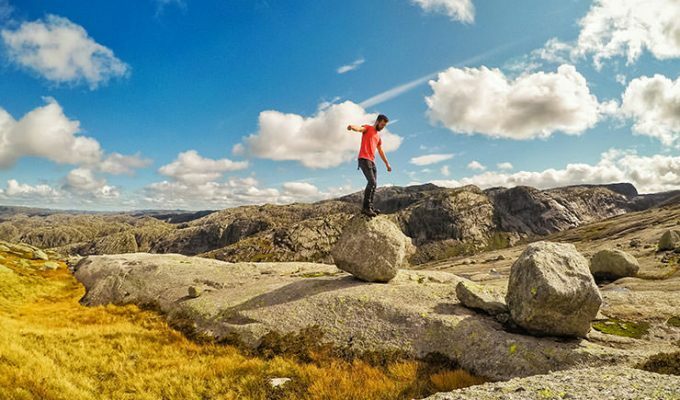 If you are looking for other extreme ways to explore Kjerag, you could try walking on the slackline, rope jumping or balancing on chairs while in the handstand on Kjerag boulder itself. 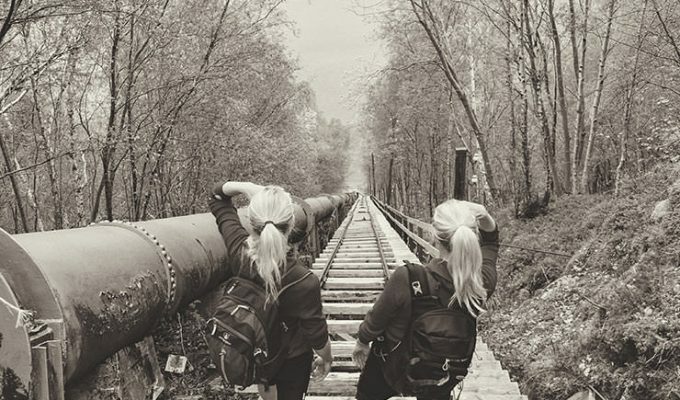 Do you want to do more amazing hikes at Lysefjord? Check Preikestolen or Pulpit Rock, one of Norway’s most famous cliffs! A season for Kjerag lasts from June till September. In winter months, Kjerag road is not open due to the snow. Choose weekdays to avoid long waits at the boulder site. Check the sunset time, so you don’t start your hike too late in the day. Don’t be afraid to ask someone’s assistance when stepping on Kjeragbolten! Kjerag – how to get there? 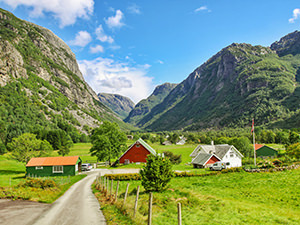 During the months of June, July and August, getting to Kjerag is quite simple; there is a daily direct Tide bus connection from Stavanger (the nearest airport) to Kjerag (Øygardstølen parking lot). The return ticket costs 66 Euros. Beware that you will have exactly 6 hours and 15 minutes to do the hike, if you don’t want the bus to leave without you. That is why for the less stressful hiking experience, I recommend staying in the closest town of Lysebotn for one night at least. Two nights, if you take into account the unpredictable weather in the area. From Stavanger, Lysebotn is also reachable by ferry, and the ticket price is 140 Norwegian Krones (15 Euros). Boats might not operate every day; check the timetable on the Kolumbus website. As I was traveling on the weekend, bus to Kjerag was the only option to reach the area. But as I’ve posted a message on Kjerag Tourist Information Facebook page, I managed to join the car ride with Timo and Viral, two other hikers heading the same way. Carpooling is not only the cheapest way to get to Kjerag, but also an ecological choice. Share the costs, reduce congestion as well as air pollution! 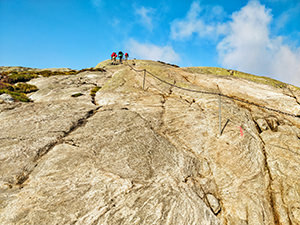 To reach Kjeragbolten from Øygardstølen, just follow the crowds and T-marked trail. If you come with a car, the parking fee is 200 NOK (21 Euro). If you head from Øygardstølen to Lysebotn, there is an exciting road with hairpin turns, one of them in the middle of the narrow tunnel! So slow down when inside; you might get surprised by an unexpected 180 degrees turn! The owner of the Hauane Bed & Breakfast, the guesthouse where I stayed, gladly picked me up both ways, while on another occasion I hitchhiked for this 15-minute ride with some Spanish hiking couple and Norwegian blokes who used the winding road for the adrenaline ride on skateboards! 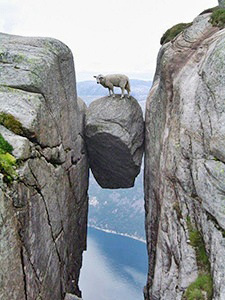 As always, mind the sheep on the way! They are not Saint-Exupéry’s drawing! As mentioned, Lysebotn in the Lysefjord’s valley is the closest town to Kjerag Mountain. 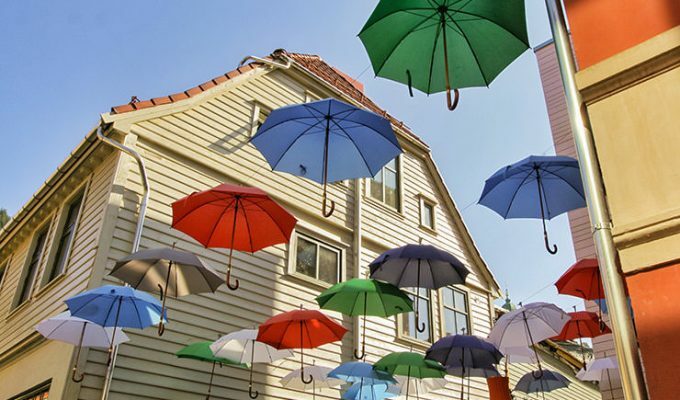 That is if you consider a place with a dozen permanent residents – a town. There is no real shop here, and only at some places, one can buy simple snacks. Still, if you are looking for accommodation near Kjerag, Lysebotn is the place to anchor yourself! This means you could start climbing Kjerag before the crowds from Stavanger arrive (which gives you some 2,5 hour advantage time!). While Lysebotn does provide hostel and campground options, the most comfortable place to stay close to Kjerag is definitely Hauane Bed & Breakfast. It is an old farm transformed into a mini hotel of just five charming rooms. Decorated with antique cabinets, smoking pipes, oil paintings, old wooden clocks and faded photographs, it speaks tradition in every little detail. That includes the tradition of hunting, so do not get too surprised when you see a bear skin rug on the dining room floor. 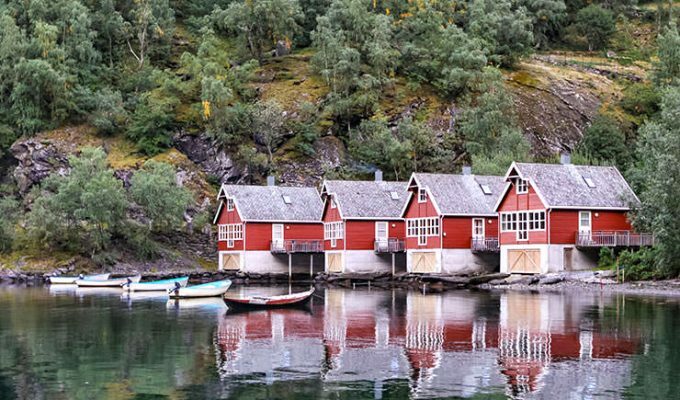 Where to eat in Lysebotn? 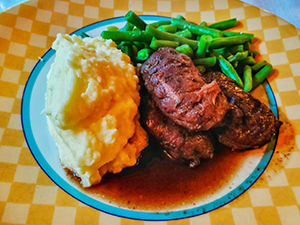 At Hauane B&B you will be able to fill yourself with energy for the hike, as traditional Norwegian breakfast here comes in the form of a hearty buffet. Local cheese, pickled fish, homemade crackers and pancakes are just some of the items on the table. If you want to eat dinner as well, you will need to order it a day in advance. For 250 NOK (26 Euros), you will get a three-course menu, and mine was quite delicious (mackerel salad as a starter, pork cheeks cooked for hours in beer for the main course, and homemade pie with plums from the garden for dessert). For an alternative, you could also head to Olavs Pub, the favorite meeting place of the BASE jumpers; eat your 185-NOK-worth cheeseburger (19 Euros) under a giant parachute stretched over the pub ceiling! If you are starving after hiking Kjerag, the restaurant at Øygardstølen parking lot might be your quickest solution. But I haven’t eaten there, so cannot share any impression. Hauane Bed & Breakfast has another surprise for its guests. After a long hike, resting in the private sauna will be a balm for your tired body! You can also choose to relax in the well-kept garden, with mountain backdrop for your afternoon tea. Single room in Huane Bed & Breakfast costs 72 Euros per night. Fun Fact: I have no idea where this mystical place is exactly, but supposedly just before reaching the top of the Kjerag Mountain, hikers can experience an unusual sensation: a sound similar to the gunshot and smoke coming out of the mountain. The first record of the phenomenon dates to 1855. Disclosure: My stay at Hauane Bed & Breakfast was complimentary, but all opinions are my own. Best Hikes in Norway : Why Hiking in Lysefjord Rocks? Visit Aurland, Norway : Stay at Aurlandsfjord like a lord!